CryoELITE Cryogenic Vials offer unrivaled cap seals that exceed DOT and IATA regulations. Optional 2D Data Matrix Bar Code Inserts provide a unique identifier for traceability. The bottom format allows for an unrestricted view of the 2D bar code, convenient for automated scanning. Made from low binding, cryogenic virgin polypropylene, with lot certified RNase/Dnase and Endotoxin free certification, providing assurance of product integrity. Loctagon™ Vial Skirt provides stability in freestanding position and locks into CryoELITE Benchmate Rack (348093) in order to provide easy open and close with one hand. Colored cap allows for color coding projects. 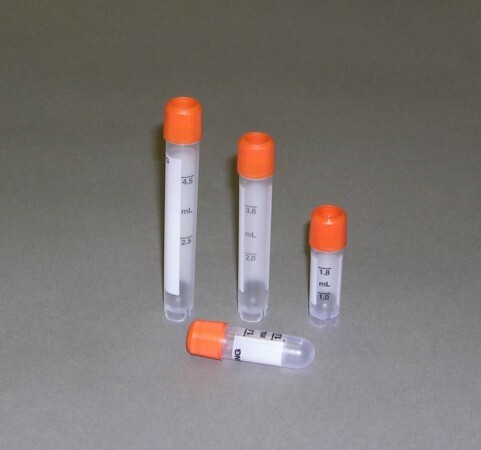 These vials are manufactured from polypropylene to withstand temperatures to -196°C. Vials have a silicone washer for a secure seal. 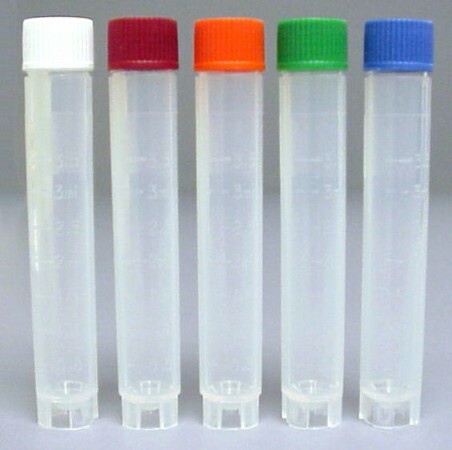 Vials can be color-coded with inserts. All self-standing vials have a special base design allowing them to be locked into the cryogenic rack and tray for single-handed manipulation. Sterile, certified non-pyrogenic. These vials are manufactured from polypropylene to withstand temperatures to -196°C. 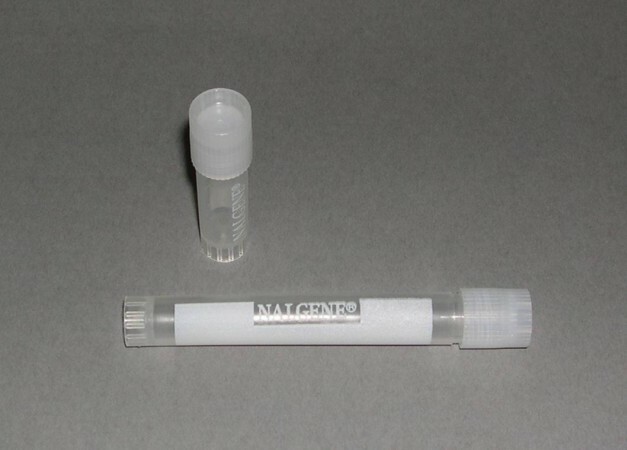 Vials have a silicone washer or rubber O-ring for a secure seal. Vials can be color-coded with inserts. All self-standing vials have a special base design allowing them to be locked into the cryogenic rack and tray for single-handed manipulation. Sterile, certified non-pyrogenic. These self-standing vials are externally-threaded vial for aseptic applications. Their basic design is similar to linerless closures used on Nalgene® bottles and carboys – a sealing ring in conjunction with specially designed threads. White marking area, fill line and graduations printed on vial. Radiation-sterilized, non-cytotoxic and non-pyrogenic. 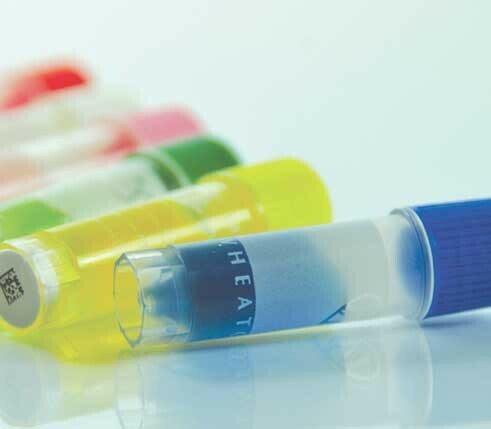 Therapak cryogenic vials are ideal for storage or transport of material at extremely low temperatures. The vials have external threads, providing a smooth and uniform inner surface. This eliminates any issues with airborne contamination or sample loss that occasionally results when using internal threaded vials. The screw cap incorporates a molded-in sealing ring which assures a tight leakproof seal. Therapak’s cryogenic vials have successfully passed the 95kPa test. The evaluation consisted of a Hydraulic Pressure Test performed by vacuum method, per ASTM D4991-94 protocol. This testing was performed to meet IATA Dangerous Goods Regulations Part 6.3.5 entitled “Internal Pressure Test”. 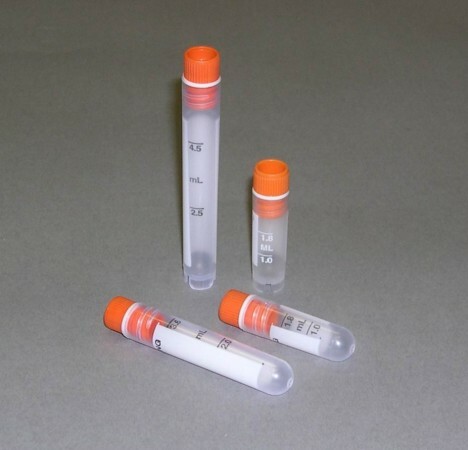 These economically priced cryogenic vials contribute toward “air eligible” standards and therefore should be a common item in clinical trial studies where serum or plasma is collected for frozen shipment to a testing laboratory. 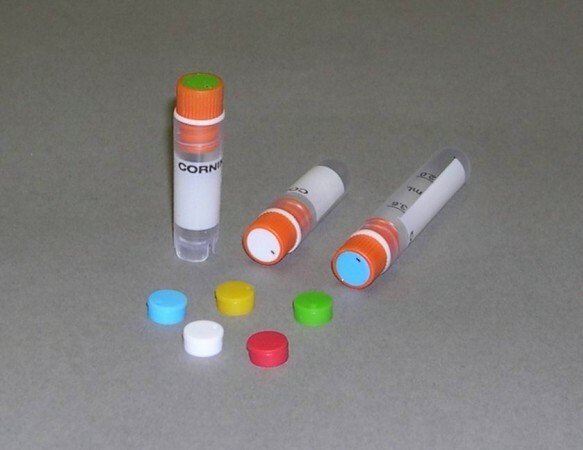 Cap inserts provide color-coding for easy sample identification. Inserts are available in resealable bags. Non-sterile. Cap inserts fit all Corning® cryogenic vials except part number 34887. 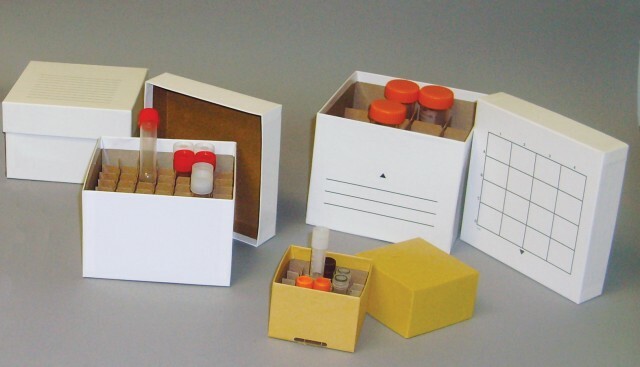 These cryogenic storage boxes are designed for low temperature storage of specimen tubes and vials. The 2” high boxes are primarily used for 1.2 mL, 1.8 mL and 2.0 mL capacity cryogenic vials. The 3” high boxes are used for cryogenic vials in the 3.6 mL to 5.0 mL capacity range. The 5” box with 49-tube slot divider is perfect for 15 mL conical centrifuge tubes and other elongated storage tubes up to 125 mm. 5” boxes with 16-tube slot dividers are ideal for 50 mL conical centrifuge tubes with or without skirted bottoms. For more information about choosing the right cryogenic storage box for your specific tube size, please contact us at info@therapak.com.